Spots and Dots: Can I do this by myself? So, I've found all kinds of tutorials on how to set up an awesome blog design! I am watching them and trying to get one set that I really like. In the middle of getting things ready for my new classroom, which I was hoping to get into Monday! Alas, we can finally get in today! I can't believe school is starting in a little over a week.....YIKES....can I possibly be ready? Well, I am going in this morning to see what I have to work with and maybe clean a little (I am admittedly a clean freak). I will post pics of my progress! Thanks to all of the wonderful teachers out there who are so generous with sharing their hard work, I have made many new things for my new kiddos this year. Here is an example of a few. 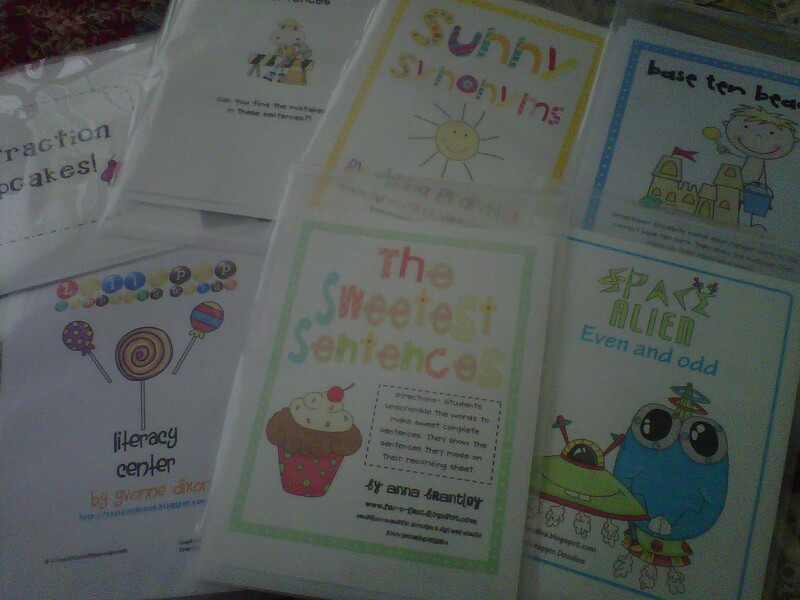 I found the wonderful plastic file folders to hold these great FREE centers at The Dollar Tree. They come in 3 packs! For a dollar! Can't beat that!! I will be watching the tutorial on signatures later this evening!